Nearly everyone knows that recycling, driving fuel efficient vehicles, and using less water and energy helps the environment. 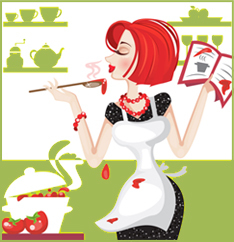 Those who are concerned about the state of our planet and who wish to do all they can to live green may be considering revamping their kitchen. The kitchen is the most important room in the house for environmental concerns as it uses, and often wastes, the most energy. It is also the key location for other activities, such as eating environmentally friendly foods and disposal of products. Replacing kitchen appliances with energy saving features is good for the environment and the pocketbook. The less energy that a refrigerator, stove, and dishwasher expend, the less the homeowner will spend on monthly bills. Though most small appliances are not Energy Star rated due to their small usage of power, there are some, like toaster ovens, that have energy-efficient versions. Many families spend the majority of their time together in the kitchen, which means kitchen lights are on most of the time. Lights that use fluorescent tubing instead of standard incandescent bulbs can reduce their energy consumption by up to 75 percent. 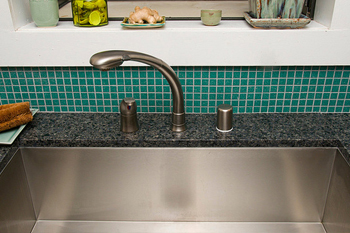 For the greenest kitchen, adding low flow faucets is an inexpensive and easy way to reduce the amount of water wasted. The best choice for is a kitchen faucet with an aerator of 1 gallon per minute. The aerator can be purchased on a new fixture or can be purchased separately and added to the existing faucet. Indoor composting is a popular way to create a new home for food refuse. Instead of throwing away certain leftovers and peelings, placing them in a compost bin helps to create an organic material for helping house plants and gardens thrive. Most recycling containers are located in the family garage or mud room. If this area is not near the kitchen, many items that could be recycled may end up in the garbage. The green kitchen should have its own recycling areas for glass, plastic, and paper items. The green kitchen does not only consist solely of the original design but also consists of the family’s regular purchases. Buy foods that are packaged in reusable containers as much as possible. Purchase fresh produce or buy out of bulk bins. Also consider purchasing local foods that have not had to travel far, therefore having the least environmental impact. It is not difficult to find beautiful, environmentally friendly decor for the kitchen. Look for kitchen mats made from recycled shoes or wall art made from billboards or recycled glass. For a fun, economical project, families can choose to make their own recycled art for everyone who enters the kitchen to enjoy. Image by j l t and licensed through Creative Commons. Bath & Kitchen Studio is an online retailer that sells high-quality bath and kitchen sinks, faucets, bathtubs and more at discount prices. Visit their website to view their latest Firecaly sinks and more.